This entry was posted in Uncategorized and tagged octopus books, wartime farm. Bookmark the permalink. oops that should have said ‘previous’ – but ‘precious’ is ok too!! Omigosh, I knew it was only a matter of time. Premieres 6th September. Can’t wait. Will try to get it from thebox.bz. I want to see this series – WAAH! and I want to read the book! I had a smallholding in South Africa, with cows and pigs and sheep and chickens and goats and rabbits (we did eat some of the livestock), and I would love to have at least chickens and some Nigerian dwarf dairy goats – or one of those hyper-small dairy cows the Cubans have been breeding. We all know the UK is suffering terribly from the recession and the austerity measures, but I ask: out of this darkness, could there be a ray of light? If books (and shows) like this can encourage the British household to eat within rations again, (and save a bunch of money), their health indices will go through the roof–just as they did the first time. EXACTLY…. my theory absolutely!! !I have to say (against all the people who continue to say it’s cheaper to eat junk food)….it is way cheaper to eat simple in season foods from scratch. Through this year I’ve eaten large quantities of extraordinarily healthy food (lots of it organic) and my grocery bill has never been less. When I see friends go out and get a sub and a drink or a takeaway at lunch that costs them between $5-$10 and I can have a huge organic spinach salad with say kidney beans, and a variety of coloured veggies for $2, it just makes economic sense for me (and healthier)..
Ditching high sodium, chemical laden processed foods and drinks, eating much smaller portions of meat and dairy, and eating lots fresh pesticide free, veg and wholefoods is the way to go. Like you have said I really hope this book can encourage people to look at their lives and make some changes (if they have economic or health issues) as it will go some ways in helping, by adopting a more simple way of living. WHY do we have to conform with our current societies way of living and eating when its obviously so unhealthy to do so? I have to say, I absolutely love Ruth Goodman. She really knows her history and she makes it come to life. And it’s always entertaining to watch Alex find some excuse for shifting his share of the heavy work onto poor old Peter, which must be some sort of universal constant in human behavior. If you haven’t seen the series or read the book The Wartime Kitchen & Garden, you absolutely must! Series is excellent – and the book is delightful. I’ve been a vegan for quite some time now, and was vegetarian for ages prior to going vegan. It’s difficult to want to eat animals when most of your professional life has been spent working in veterinary medicine. Ya know? My cousin and I were recently chatting about eating healthy. He was saying how expensive it is to eat healthy, and I was completely boggling. I eat huge amounts of food, I have an incredibly varied diet, my omni friends are forever stealing my lunches and asking for dinner… and yet I have the lowest food budget of anyone I know. I’ve spent a lot of time rambling about this on my own blog, but I think it really boils down to a couple of things: people value convenience over health, people are not taught how to cook at home nor is cooking taught in schools and people really don’t know how to shop. It’s truly a shame. I am excited for the book and series – fully intend to add to my collection. I really hope that it makes a difference, or at least makes people think. Hi, I know how you feel as, l to, have a review copy being sent! I watched the previous series; Edwardian Farm and Victorian Farm both excellent. But THIS is the one for me. A lot of people, my Mum included, vividly remember the hardships of rationing in this country and how close they all came to starvation had it not been for the efforts of our farmers and the nation joining in the Dig for Victory campaign. Hope you manage to get to see it. Failing that the BBC normally release a DVD shortly afterwards. Maybe we can compare notes on the book? British farmers did an awesome job, as did the Land Girls, the housewives, and the office workers of both sexes who put in hours after gruelling work days. If I remember the figures correctly, before the war Britain imported 60% of its food; when Dig For Victory got into full swing, the nation’s imports dropped to 30% of its food. About half of these deaths were intentional; the Nazis deliberately killed those they deemed “useless mouths” by withholding food. The rest died of war-induced hunger, sometimes by siege, sometimes simply because there was nothing to eat in the war-wrecked landscape. People died of starvation in the first winter after the war, too, in several countries. One of the reasons rationing went on so long in Britain after the war ended was because of the need to feed Europe, where farming had been totally devastated, with land laid waste over large tracts, farmhouses destroyed, and farmers killed. In the 1994-95 war in Croatia, 1/3 of Dubrovnik’s food was produced INSIDE the city walls, in people’s tiny gardens, and on their tiny terraces. The city fathers, with remarkable foresight, had stored tons of food in the old granaries, knowing how easily supplies could be cut – and indeed Dubrovnik did face protracted siege with the single road cut by the Serbs. I always tear up when I remember how the menfolk of the islands would row their little wooden fishing boats at night (didn’t show up on radar, so low to the water that they were often not seen by lookouts) as close as they could get, and then swim ashore with bundles of food on their heads, for the beleaguered city. Hmm, I should get to it and grow more food! My foggy, cold, shaded back yard does at least reliably produce potatoes and kale! I’ve always been obsessed with austerity/ration/wartime cookery. Wartime cookery books from Germany (where food shortages in both world wars were of astonishing magnitude) boggle the mind. Cooks were amazingly creative. The thing I can’t help thinking though, is that one of the key differences between then and now, is that people knew how to cook to begin with. Yes, there were some convenience/processed foods available – but they were not generally daily staples. Food preservation was not about the the fridge, freezer and a list of additives as long as your arm like it is now. Carolyn, Thank you so much for the heads up on that. I too am now excited. Only two days to go… I do love the BBC! OMG is it on tonight???? It was and it was brilliant. I have downloaded a pdf copy of the Open University booklet that goes with the series. If you want a copy, send me an email and I will forward it to you. Also I ordered a paper copy in case you couldn’t get hold of one in Canada. Again, if you want it, let me know an address I can send it to and I’ll post it on. I don’t know the internet safe way of doing this. I’m no stalker (much as I’d love to go to Canada), but safety first! That is indeed what I am talking about. Do you want a paper copy or are you fine with the pdf? So envious that you’re getting this book, just looked on Chapters and it isn’t available there yet….maybe I’ll get it for Christmas:) You look amazing by the way. 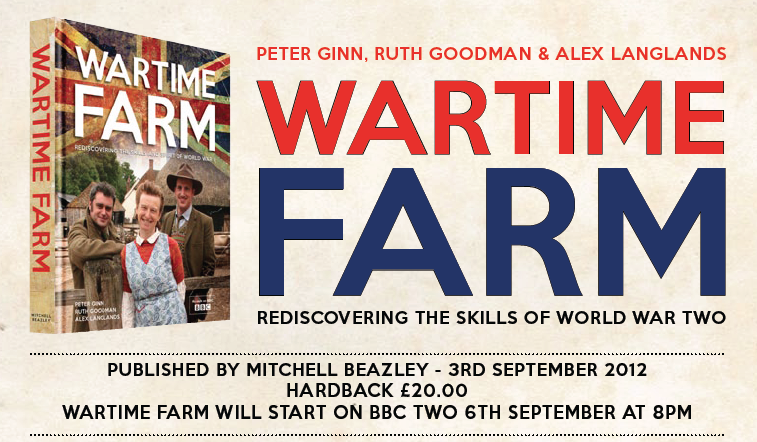 Just watched the first episode of Wartime Farm on BBC2 this evening and its BRILLIANT! It is very realistic from the clothes they wear, the wallpaper in the kitchen and the lighting. They sit listening to the wireless and Churchill’s speeches. Very stirring. As usual, things never go to plan, and they have big problems when trying to drain a field but its all very watchable. Good luck with the other recipes.